Pilkington Optimirror™ OW Protect - safety backed glass is not unbreakable, but does offer a higher quality of shatter resistance when compared to normal glass mirror and greater clarity than a plastic or stainless steel mirror. Acrylic mirrors are shatterproof and ideal for many indoor applications. Polycarbonate mirrors are extremely robust, offering impact strength of around 30 times that of acrylic mirror and over 250 times greater than that of glass. Stainless steel mirrors are virtually unbreakable and suitable for a wide variety of applications, particularly where hygiene is important and the possibility of abuse is greater. Please call us for advice on choosing the right type of Safety Mirror for the intended application. 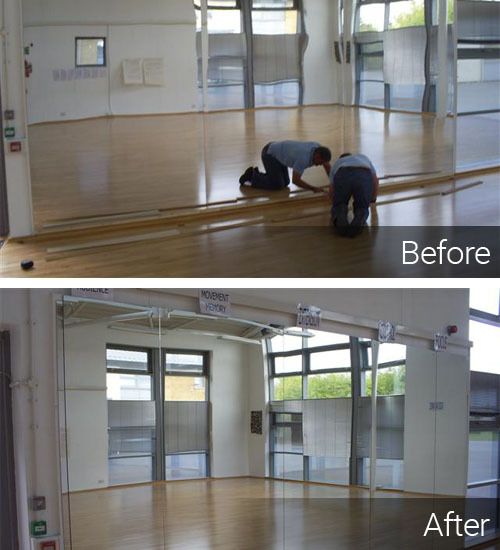 The images below show a poorly installed Acrylic Mirror wall in a dance studio. Note how the Acrylic Mirrors distort the image. Aspect Safety Mirrors removed these poorly fitted mirror panels and replaced them with our Pilkington Optimirror™ OW Protect mirrors, installed in the correct manner for the application. To be effective the size of the mirror should be adapted to the distance separating the viewer and the mirror. Recommended maximum distances are indicated for each product. The amount of angle of convexity of a mirror determines the field of vision and must be adapted to the number of directions wished to be viewed. Fixing kits are supplied with these mirrors.